Stephanie Tsantes, then 17 years old and a senior in high school, was in bed when her father left for work on the morning of November 15, 1983. "I had to go to school," Tsantes, now an attorney who lives in Lewes, recalled last week. "The last thing he said to me was, 'Are you sure your eyes are open?'" Those were the final words she would ever hear from George Tsantes, the man she recalls as a loving perfectionist, a parent so devoted to his children and their education and hobbies that he seldom mentioned his own work. His work had taken him to prominence within the Navy. It was the reason he and his wife, their daughter and the younger of their two adult sons were living in Greece. A nuclear physicist and Annapolis graduate, he had captained ships and now was the head of the Joint U.S. Military Advisory Group in Greece. He was a year from a planned retirement, finishing his career in his favorite foreign nation, the land in which his parents and parents-in-law had been born. The land in which he would be assassinated before his daughter's classes even began that morning. Most Americans may have paid scant attention to terrorism prior to the September 11 attacks, but it has been part of Stephanie Tsantes' life from the moment she was called to the principal's office and told that her father had died in a "terrible accident." "I said, 'There was no accident,'" she recalled. "'Tell me what happened.'" She has been learning, agonizingly slowly, ever since. And next month, she finally may hear the whole story. Tsantes was to leave Tuesday, February 25, 2003, for Athens where the alleged killers of her father and more than 20 other people will be tried, starting next week. The 19 defendants are suspected members of a Greek guerilla unit called November 17, which eluded authorities for 27 years as it acknowledged responsibility for one killing, one wounding, one robbery after another. Until last summer, not a single arrest had been made in any crime which November 17 said it had committed. Press accounts routinely referred to the group as the shrewdest, most elusive of its type. November 17 took its name from the day in 1973 when Greece's military dictatorship used tanks to crush students and workers who occupied a university in protest of the unpopular regime. More than 30 of the protesters were killed and 800 injured. The bloody repression of the uprising fueled widespread loathing of the Greek military, leading to the return of civilian rule in Greece. But Greek's subsequent leaders, whether socialist or reactionary or somewhere in between, won little praise in the statements that began emanating in 1975 from the previously unknown November 17. The group was pro-communist, though it was quick to label prominent Greek communists as sell-outs more interested in sharing power with mainstream politicians than with stirring up revolution. November 17 was perhaps most notable for its fierce nationalism, its hatred of anything it deemed unfit for Greece, not least of which was the presence of U.S. military and intelligence personnel. The world first learned of November 17 around Christmas 1975 after three attackers shot and killed Richard Welch, the Athens station chief of the U.S. Central Intelligence Agency. "By choosing such a high-profile target, 17N aimed to put itself immediately on the map and establish credibility as a revolutionary group," journalist George Kassimeris wrote in his book "Europe's Last Red Terrorists: The Revolutionary Organization 17 November." By the time George Tsantes left home for the final time, November 17 had boasted of killing four Greek police officers in addition to Welch. But it had been out of the limelight since the last of those slayings three years earlier and, said Kassimeris, "it was widely thought the group had auto-dissolved." George Tsantes was gunned down as he rode toward his office with his Greek driver, who also was assassinated. November 17 said the attack was in protest of the policies of Greece's then-socialist leadership and of the American presence. "The Tsantes attack heralded the transition of 17N ... to a full-scale terrorist campaign," Kassimeris said. "In fact, the group used the assassination to declare war against the Americans, inaugurating a campaign of violence to remove them from Greece." A few months later, November 17 shot, but failed to kill, a U.S Army Master Sergeant. Kassimeris recalled that that incident, like the Tsantes attack, was followed by a statement from November 17 that began, "The (U.S. military) bases will not leave with either elections or parliamentary methods ... Only dynamic mass struggle and justified popular revolutionary violence will force them out." The mass revolt envisioned by November 17 never materialized. But the group's violence persisted -- in all, 23 murders (including three American victims), scores of bomb and rocket attacks and a string of robberies to finance the wave of terror, authorities said. For nearly a quarter-century, Greek investigators tried to identify and apprehend November 17. European and American governments offered assistance and millions of dollars in rewards for information -- to no avail. Foreign observers accused the Greeks of ineptitude and indifference, suggesting Greece be removed as host the 2004 Olympics unless it solved the case. Stephanie Tsantes watched from the United States, frustrated. Her family, she said, resented its "unfulfilled justice." They got help from Senator Joseph R. Biden, who as Chairman of the Senate Foreign Relations Committee had influence in capitals around the world and could pressure Greek leaders to intensify their investigation. "Senator Biden has been on Greece's case for years to do something about it," she said. But for years "there was no arrest, not even a phone call (from Greek authorities). We still have heard little from them. We learn far more from the Internet than from them." Not only had November 17 avoided arrest, it apparently had escaped injury. Its bullets and bombs, its ambushes and rocket attacks, had done no known physical harm to its members. Then, last June 29 in the Greek city of Piraeus, a 40-year-old painter named Savvas Xeros was seriously wounded by a bomb he allegedly was carrying. In custody, he allegedly confessed to being on a November 17 mission and revealed damaging information that launched a series of arrests and, according to authorities, a number of similar confessions from other November 17 members. "Quite frankly," Stephanie Tsantes said, "it wasn't through any good police work that the Greeks broke this up. The guy blew himself up, then started singing like a canary." Xeros and many of his co-defendants were not exactly in hiding. One ran a souvenir shop in central Athens while others include a telephone operator, a translator, a bus driver and an elementary school teacher. They face possible life imprisonment. Greece has no death penalty. Tsantes plans to spend 10 days in Greece as the trial begins, then return to testify about how her father's death has affected her family. The trial will combine elements of both criminal and civil law as administered in the United States. Not only will the defendants be found innocent or guilty, but they may be ordered to pay damages to victims and victims' families. "That's not my family's concern," Tsantes said of the possible payment. "We obviously want to see these people in jail." In the living room of her unimposing two-story frame house on Kings Highway is a photograph of her father, in uniform, a huge smile on his face as he sits on the lap of a fellow sailor, who is dressed as Santa Claus. The picture was taken in the early '80s in Norfolk, Va., at a party for children whose parents served aboard the U.S.S. Piedmont, which George Tsantes commanded at the time. "Most of my pictures of my father in uniform show him so serious," Stephanie Tsantes said. "This one shows him more as he really was." He was a man who took pride on having two sons who were Eagle Scouts and athletes and a daughter who excelled in music. He encouraged them, Stephanie said, without being overbearing. "He was an easy-going perfectionist," though his doggedness could literally cost him sleep, she said. "He was the one who'd go over my homework. I had a math teacher in high school who'd always throw in a problem none of the kids could figure out. It was for amusement. My father, no matter how long he had to stay up, would solve it." One night, she said, he sent her to bed at 2 a.m. after they'd failed to find the correct answer together. Four hours later, he woke her to say that he'd succeeded, and to explain how. She credits his influence, and perhaps the circumstances surrounding his death, with motivating her toward a career in law and a role as a community activist. She is a prosecutor in the Sussex County office of Delaware Department of Justice and a member of Lewes City Council. "My father stressed public service," she said. Her job choice may have been spurred by "a feeling that if I can't justice for our family, I can get it for others." Now, others may understand her situation better than they once could. September 11 left an entire nation grieving as she and her family had. No longer is their tragedy so unusual. "You always felt," she recalled of the years before the assault on America, "nobody would understand when you said, 'My father was killed by terrorists.'" Son of slain Navy officer wants suspect terrorists to stand trial for his father's killing. The son of a U.S. Navy Captain killed by Greek terrorists 20 years ago on Friday said he considers it a "tragedy" that no one will answer for his father's assassination. Police have arrested 18 alleged members of the far-left November 17 group in the past 5 months, but none of them have so far been charged with the 1983 shooting of Captain George Tsantes and his Greek driver. The case could soon close because of a 20-year statute of limitations on murder. November 17 has been blamed for 23 killings and dozens of bomb and rocket attacks since it first appeared with the 1975 slaying of CIA station chief Richard Welch. It claimed responsibility for killing Tsantes. Nearly all the suspects, 17 men and a woman, have been charged with murder in most of the killings and will go on trial in early March. They are also charged with numerous bank robberies, explosions and bomb attacks. "Certainly, whether it was good police work or luck, I am very happy that these guys are behind bars and that the Greek system is proceedings with their trial," George 'Chip' Tsantes, from Great Falls, Virginia, told The Associated Press. Tsantes' 53-year-old father was killed while driving to work on November 15, 1983, and buried a week later at Arlington National Cemetery. He was the second of four American officials killed by the group, which eluded arrest for 28 years. Other victims include two Turkish diplomats and prominent Greek political and business figures. The group's most recent victim, British defense attache Brig. Stephen Saunders, was killed in 2000. "We talked to all authorities and there is nothing that can be done about this case, and I really feel bad," said Tsantes, a 43-year-old partner at a management consulting organization. "People can say that they pulled the trigger and nothing can happen to them. It is a tragedy." November 17 is named for the day in 1973 when Greek military rulers crushed a student-led uprising. The group espoused an often confusing mix of Marxist and nationalist ideologies. Tsantes returned to Athens for the first time since his father's death to attend a vigil for terrorist victims. "Particularly as a Greek American it really hurt," said Tsantes. "This still doesn't make any sense ... and this makes it even worse, because these people were murdered for no reason. It was a complete waste." According to Tsantes, his father was one year away from retirement, while his driver, Nikos Veloutsos, was only a couple of months away from his own. He will return to Greece for the trial as he is among family members of American victims who have filed civil suits against the suspect terrorists. "I plan to be here for part of the trial and the rest of my family will be making trips to Greece as things progress," he said. Also involved in the civil suit are U.S. Army Sergeant Robert Judd, who was shot and wounded in a 1984 shooting; the widow of U.S. Embassy defense attache Captain William Nordeen, killed by a bomb in 1988, and the daughter of U.S. Air Force Sergeant Ronald O. Stewart, who died in a 1991 bomb attack. Captain George Tsantes, Jr., United States Navy, was assassinated in Athens, Greece, on 15 November 1983 when he was gunned down while being driven to his office where he was serving as chief of the naval section of the United States Military Advisory Group. His chauffeur was also killed in the attack. Services were held in New Jersey on 21 November then on 22 November at the St. Nicholas Greek Orthodox Church in Virginia Beach, Virginia. Interment took place in Arlington National Cemetery on 23 November after memorial in the Fort Myer Chapel. Appointed to the Naval Academy from the State of New Jersey, Captain Tsantes was of Greek descent and had been serving in Greece for about seven months. Prior to his appointment to the Academy, he had attended the Drexel Institute of Technology for three years, and he was graduated in 1955 as number twenty in his Class. After sea duty he undertook nuclear power studies and served as engineering officer aboard nuclear-powered surface vessels, including duty as chief engineer in Enterprise, and he had also served a previous tour in Athens. Other sea duty had included command of the destroyer William M. Wood and the destroyer tender Piedmont. He had earned a master's degree in physics, and was a member of the Naval Academy Alumni Association. He is survived by his widow Thalia; two sons and a daughter. I'm sure we all heard the tragic news of George Tsantes' death in Athens, Greece, on 14 November. Our hearts go out to George's wife Thalia, and their three children. I understand they had just arrived in Athens last March on what was to be George's sunset tour. George was interred in Arlington National Cemetery on 23 November 1983. 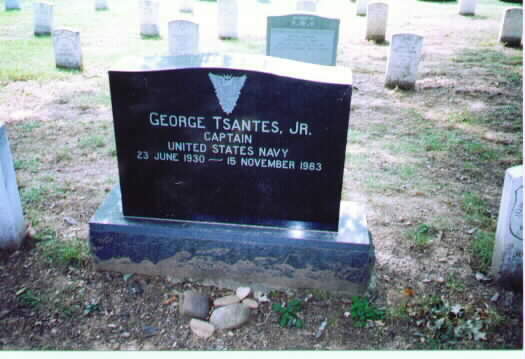 TSANTES, George, Jr. Captain, USN Killed in Athens, Greece in November 1983. True to the Lucky Bag's description of George's "call of the sea" his sea tours included assignments as Engineer Officer, U.S.S. McNair (DD679) and Communications Officer, Destroyer Squadron 30. Following training at the Nuclear Power Training Unit, Idaho Falls, Idaho and West Milton, New York, he was assigned to the precomissioning detail, U.S.S. Bainbridge DLG(N)25 serving as Reactor Control Division Officer, Main Propulsion Assistant and Operations Officer, and participated in the World Cruise of Nuclear Task Force One. Further sea tours included Commanding Officer, U.S.S. Piedmont (AD17) and Staff Material Officer, Service Group Two. Post Graduate work was completed in Monterey, California where he was awarded a Master of Science in Physics. Shore assignments were in Washington, D.C. where he served on the Staff of Chief of Naval Operations, having served three years in the Navy Atomic Energy Office and two years on the Staff of the Director, Research, Development, Test and Evaluations as the Head, Nuclear Branch. There were many awards and honors through the years, but two he did not live to accept were the Defense Superior Service Medal and the Purple Heart which were presented to the family at the American Embassy, Athens. The night before the nightmare George began mounting his cancelled stamps of the new series of United States stamps and got as far as New Jersey before calling it quits for the evening. These stamps had been used on letters he had sent us from various locations he had had to report in preparation for his assignment in Greece. His stamp collecting days began at the Academy and continued all his life. He also loved to bike ride, garden, plant trees, lie on the beach, and dance (both Greek folk and ballroom). Just the week before, we had attended the Marine Ball at the Athens Hilton and danced 'til the wee hours. visit us in Carmel, California after not seeing the house for two years he drove right on by, not recognizing the beauty George had created in the landscaping. With our sons he was very active with their sports and scouting activities and was very proud of his two Eagles. The 50 mile Scout Bike hike along the C & 0 Canal was one of his pleasures. They had both graduated from College; George III from Virginia Wesleyan and Nicholas from Davidson. Chip is now an MBA candidate at Old Dominion University and living at home, while Nick is employed by Raytheon in Whalen, Massachusetts and plans to begin study in engineering at night in September. Our daughter Stephanie is a sophomore at Mount Holyoke College in South Hadley, Massachusetts with a concentration in International Relations. Her musical talent brought George much pleasure as she received many honors for her cello, piano, and Church organist activities. This summer she was invited to play with the Virginia Beach Pops Orchestra with Walter Noona. I have been busy updating other decorating projects we had planned for our home in Virginia Beach, Virginia. Graduate studies were on the back burner for years so now I am actively pursuing a Masters in Guidance and Counseling at O.D.U. I hope to soon be employed by the Virginia Beach School System either as a teacher or as a substitute. It is a comfort to us to reminisce and fondly realize that George was a very happy man and loved every day of his life. The harder he worked the happier he was. He loved his family, work, Church, friends. Please know he was proud of the U.S. Naval Academy and his class. It was easy to sense this as he proposed to me with the crest and surprised me our first Christmas with the miniature which I still wear and treasure. George is missed more than words could ever describe, but his quiet strength and remarkable power of communication through the years guided the children and me through the dark and murky waters of this new war of terrorism for which he was not trained to fight. George Tsantes - 18th Company. This classmate was deliberately, methodically and successfully targeted for political assassination. The description of "terrorist attack" infers a casual or accidental happening - wrong place at right time etc. I was USEUCOM Deputy for Security Assistance when George was the Chief of the Navy Section, MAAG Greece. His death and the near simultaneous hit on the U. S. Army Attache in Paris started the retaliatory planning exercise that 3 years later (and after a dozen more attacks on U. S. military folks in Europe) culminated in the USAF F-111F and Navy A-6 raid on Khedafi (plus some other minor - still unpublished - activity in Greece). A 1983 ambush that killed U.S. Navy Captain George Tsantes and his driver and the 1988 slaying of Greek industrialist Alexandros Athanassiadis. The group has never targeted a British national before, but has claimed responsibility for bomb attacks against British banks and other sites. Last year, the group issued a communiqué challenging authorities to "come and get us..."